After a brief soft opening phase, The Thirsty Crow officially opens its doors to the public tonight. The newest bar from The 1933 Group (who also own the Bigfoot Lodge bars, Saints and Sinners, and The Little Cave) is actually a complete overhaul of their own Stinkers Truck Stop. Gone are the animatronic skunk butts and the beer can walls, replaced by a warmly decorated interior and an extensive bourbon menu assembled by Bigfoot West bartender Brandon Ristaino. The Thirsty Crow hosted a media preview event on Wednesday, and thanks once again to an invite from Caroline on Crack, I was able to try a few of the cocktails and sample some of the good stuff. Co-owner Bobby Green (L) chats with a guest. When you walk inside, it’s hard to believe this place used to be Stinkers. 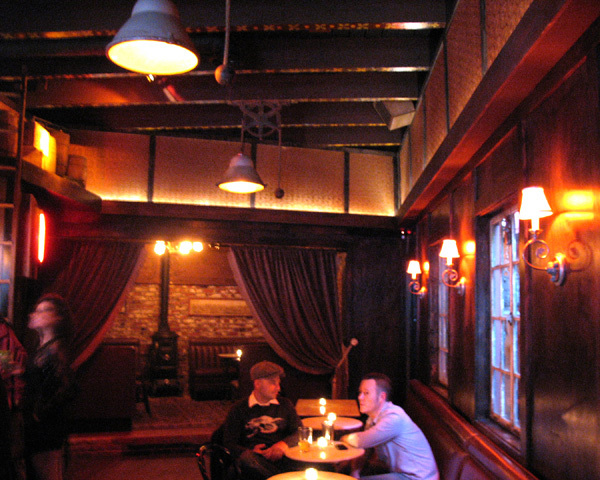 The main room is still dominated by a horseshoe-shaped bar, with two tops to the left and tables to the right, leading to a more secluded back room. A narrow alley functions as the smoking area. Antique items such as wall sconces, mirrors, and a stove add to the comfortable atmosphere. One of the coolest jukeboxes I’ve seen in a while plays 78s for background music, thankfully at a level where guests can still have an actual conversation. A few crows are hidden in plain sight throughout the space, keeping an eye on things. At the beginning of the menu is Aesop’s Fable of the Thirsty Crow (aka The Crow and the Pitcher), the story of a parched crow who drops stones into a jug to sip the life-giving water whiskey at the bottom. Then there are helpful definitions of bourbon, rye, and scotch. 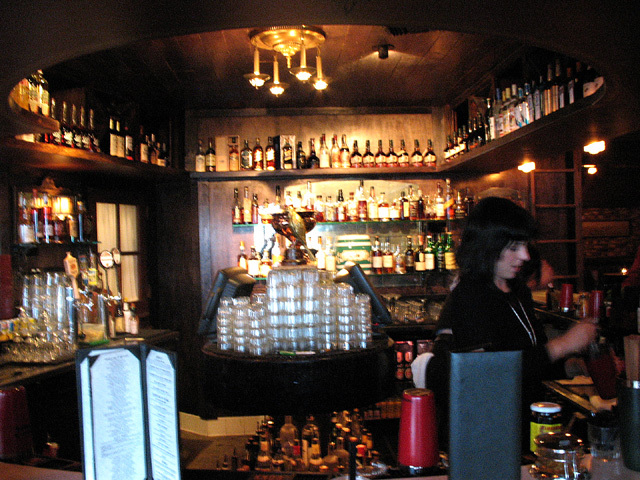 Opposite this page is a list of cocktails: Classic (Mint Julep, Old Fashioned, Sazerac, Whiskey Sour), Manhattans (Traditional Rye, Black, Marmalade, Molé), and Sparkling Wine Cocktails (Champagne Cocktail, Raspberry Royale, Death in the Afternoon, The Seelbach, Violet Vapor). The Classics and Manhattans are priced at $12, while the Sparkling Wine Cocktails are $10. There are a handful of wines and several beers on tap, but they’re not what this Crow is really thirsting for. Although I was tempted to try one of the Manhattans, I started with the bar’s namesake cocktail, the Thirsty Crow (Jim Beam rye whiskey, citrus, ginger beer and bitters). 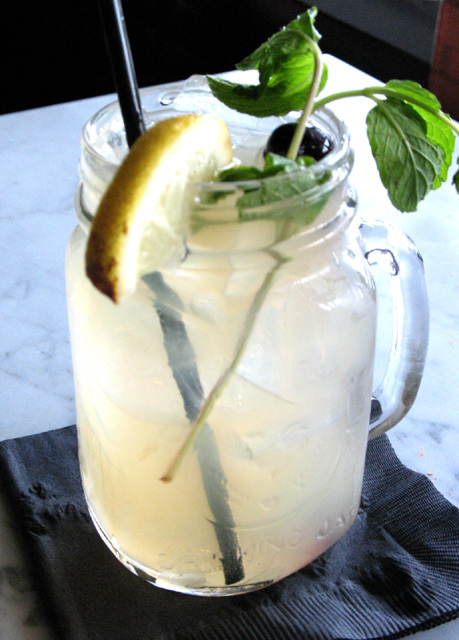 Served in a mason jar, the Thirsty Crow is dangerously good, a cocktail that even non-rye drinkers will enjoy. It’s nicely balanced between rye, tart, the tangy ginger, and depth from the bitters. The Thirsty Crow was easily the consensus favorite cocktail of the night. 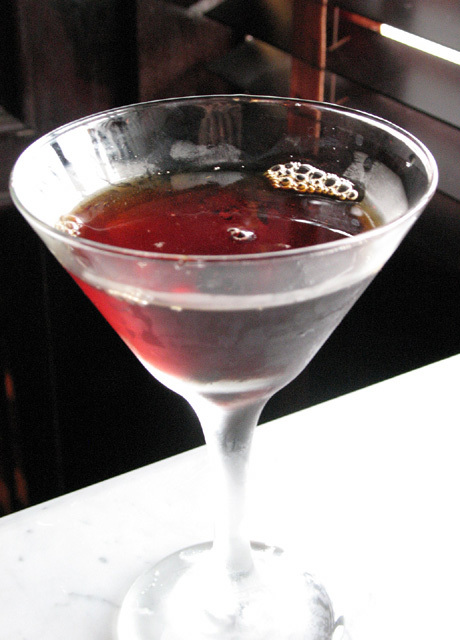 Caroline began with a Black Manhattan, described as “adventurous with a suggestion of caramel.” It’s another winner, balanced between smoke and sweet and perfectly matched to the Crow’s decor. Meanwhile, Esther from e*star LA gave me a sip of her tasty Sazerac, properly made with Jim Beam rye, Peychaud’s bitters, sugar, an absinthe rinse and lemon. Caroline next tried the Molé Manhattan, which was much less well-received. None of us liked it, and it sat nearly untouched after our initial sips. Far better was The Seelbach, a pre-Prohibition cocktail re-discovered by a Seelbach Hotel bartender in the mid-90s. It’s a genteel cocktail made with Bookers Bourbon, sparkling wine, bitters, and citrus, served in a champagne flute. 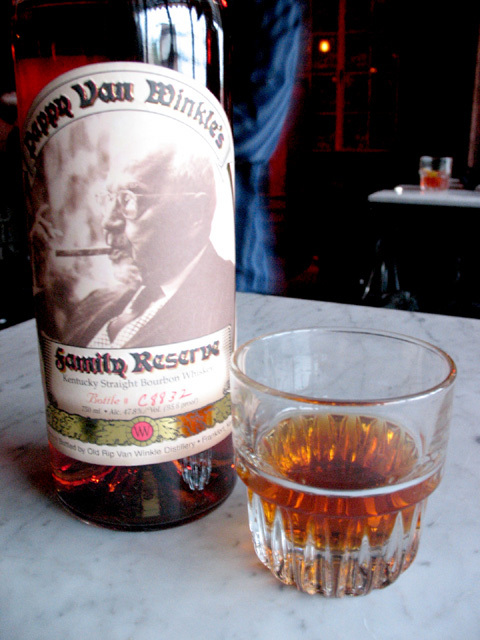 The good stuff: Pappy Van Winkle 23 Year Old. I was particularly interested in the long list of dozens of whiskies, ryes and bourbons, plus another section of two dozen Scotch whiskies. Skipping over familiar names like Maker’s Mark, Knob Creek and Woodford Reserve, my eye went straight to the Pappy Van Winkle’s Family Reserve 23 Year Old, at $40 the most expensive shot on the menu. The price is understandable, considering a bottle originally retailed for over $250 and is nearly impossible to find now. Josh from Food GPS took the initiative and asked if it was possible for us to get a taste. Happily, his request was approved, and we passed the glass around. This is heaven in a bottle, intensely flavored with maple and vanilla, moving on to caramel and smoke, and lingering with a long, velvety finish. It’s a spectacular bourbon, and sipping it is a rarefied experience that I hope to have again. Four Roses Single Barrel Bourbon – surprisingly mellow for a 100 proof bourbon, Four Roses has a fruity, spicy nose and a long, smooth finish. High West Rocky Mountain Rye 16 Year Old – recommended by my friend Scot, who visited the High West distillery recently. At 80% rye, it’s a powerful, spicy whiskey that made several new fans. Rittenhouse Very Rare 23 Year Old Single Barrel Rye – less rye forward than the High West, but at 100 proof it has more of an oak-flavored, spicy kick. Long, smoky finish. Although we sipped the pricier offerings, the whiskey menu is is actually closer to $10-15 per shot, on average. Needless to say, it will take some time (and quite a bit of scratch) to work our way through the list, which Ristaino says will be constantly expanding in the months ahead. To help newbies learn about whiskey (or for those who want to brush up), the Thirsty Crow will host Whiskey Education classes every Sunday from 9pm to close. As the event wound down, I had a chance to chat with co-owner Bobby Green. 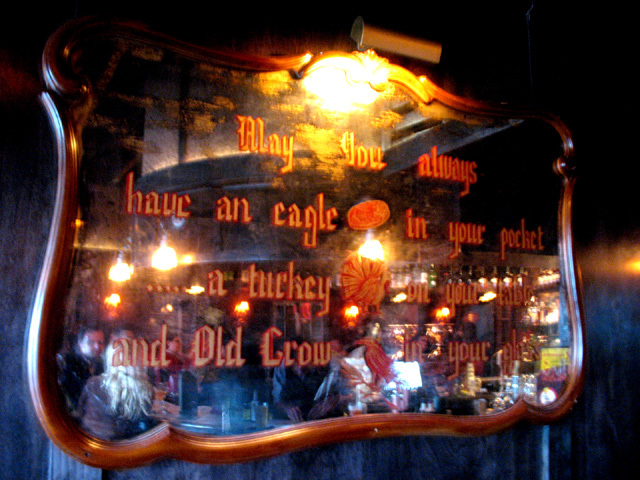 We both have an appreciation and interest in history, and with the Thirsty Crow he’s created a bar that conveys his love of nostalgic Americana more than any of his other venues. The Grand Opening starts at 5pm on Friday, April 23, 2010.